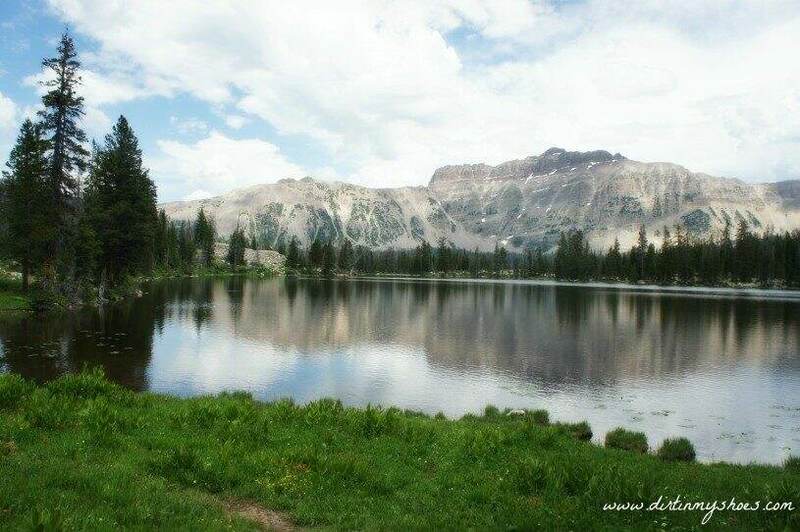 Ruth Lake is a gorgeous high alpine lake with dramatic views of the Uinta Mountains! Although the trail is short and sweet, you are rewarded at the end with one of the most stunning mountain landscapes in the state of Utah. I think that Uinta Mountain wilderness is one of Utah’s best kept secrets. While not that far from Salt Lake City, most people don’t know much about the area or what it offers to the enthusiastic hiker. Although Ruth Lake is a popular area because of its sheer beauty and easy trail, it still sees much less foot traffic than many other trails in the state. We passed a few people on our hike, but when we reached the lake we had it all to ourselves. There is nothing better than lounging lakeside, breathing in the fresh mountain air and marveling at such a majestic view! The trailhead for Ruth Lake has a pit toilet but no running water. A fee is charged to hike this trail and any other trails along the Mirror Lake Highway. More information can be found here. Bring along the Interagency Annual Pass (the one to get into all of the National Parks) if you have it, because this pass is honored and no fee is needed if your card is valid. The Ruth Lake trail is great for all ages and abilities and is a great place to start if you are a beginning hiker. That being said, even as an experienced hiker, this lake is one of the prettiest lakes I have ever seen and I thoroughly enjoy this trail. No matter your skill level, the hike to Ruth Lake is a great choice! From the beginning, the trail is well-traveled, mostly flat, and easy to follow. Watch the sky for afternoon thunderstorms (which are extremely common in the Uinta Mountains) and be prepared with the proper rain gear. I also suggest using bug spray to ward off the swarms of mosquitoes that also love to be at Ruth Lake in the summer. Along the way you will pass many ponds. Some of these ponds are very small and others are a decent size. Ruth Lake is bigger than these ponds so don’t get confused by them…..keep on hiking! I strongly recommend hiking this trail during wildflower season (late June to early August) for a stunning display of colors along the way! The hike passes by a gorgeous meadow in full bloom and we had a great time counting how many different colors we could see. When you reach Ruth Lake, the trail will fork. I suggest taking a right and following the trail that takes you along the lakeside. The most breathtaking view of Ruth Lake is found on the far side of the lake. From here, you can see the dramatic Hayden Peak reflected in the clear water. I highly recommend following the trail around until you get a great view! On the far side of the lake the trail fades. We couldn’t find a great way to continue going all the way around without creating our own trail, so for that reason we returned the way we came. The trail to Ruth Lake is 2 miles round trip. I would consider this to be an easy trail because of its short distance and very little elevation gain. Make your trip to the Uinta Mountains a weekend getaway by camping at the nearby Mirror Lake Campground. Don’t forget your rafts and fishing poles! From Salt Lake City, take Interstate 80 East for approximately 30 miles until you reach Highway 40, exit 146. Head south on Highway 40 for about 3 miles before taking Exit 4 to Kamas/Park City. Turn left onto Highway 248 and follow the road for 12 miles. When you reach Main Street, take a left and drive two blocks until you reach Highway 150. Turn right onto Highway 150 and drive to the Ruth Lake Trailhead, located at mile marker 35. Have you been to Ruth Lake? Do you have any questions about the trail? Let me know in the comments below! We are visiting Salt Lake this weekend from Washington DC. Is it too late in the season to do the Ruth Lake hike? Is there snow on the trail? As of right now, the Mirror Lake Highway is open. We got some snow in the mountains a few weeks ago, but it’s been relatively dry lately. Weather permitting, you should have no problem hiking this trail!